The TCP/IP model is a concise version of the OSI model. the Open Systems Interconnection (OSI) model, developed by ISO , is a conceptual framework that describes the functions of a networking or telecommunication system. 6. Presentation: it represents the preparation or translation of application format to network format, or from network formatting to application format. In other words, the layer “presents” data for the application or the network. A good example of this is encryption and decryption of data for secure transmission - this happens at Layer 6. 5. Session: Provides services to organize its dialogue and to manage data exchange. Functions at this layer involve setup, coordination (how long should a system wait for a response, for example) and termination between the applications at each end of the session. 4. Transport: The Transport Layer deals with the coordination of the data transfer between end systems and hosts. Defines services to segment, transfer, and reassemble the data for individual communications between the end devices, how much data to send, at what rate, where it goes, etc. The best known example of the Transport Layer is the Transmission Control Protocol (TCP), which is built on top of the Internet Protocol (IP), commonly known as TCP/IP. 3. Network: this layer is responsible for packet forwarding. You might know that your Boston computer wants to connect to a server in California, but there are millions of different paths to take. Routers at this layer help do this efficiently. 2. Data link: The Data Link Layer provides node-to-node data transfer (between two directly connected nodes), and also handles error correction from the physical layer. Two sublayers exist here as well - the Media Access Control (MAC) layer and the Logical Link Control (LLC) layer. In the networking world, most switches operate at Layer 2. The network (3) and data link (2) layers (OSI) are responsible for delivering the data from the source device to the destination device. Protocols at both layers contain a source and destination address, but their addresses have different purposes. Data link layer source and destination addresses – Responsible for delivering the data link frame from one network interface card (NIC) to another NIC on the same network. A Media Access Control (MAC) address or physical address, is the address of the device’s NIC. Network layer source and destination addresses - Responsible for delivering the IP packet from the original source to the final destination, either on the same network or to a remote network. Host portion – The remaining part of the address that identifies a specific device on the network. The host portion is unique for each device on the network. Network portion – The left-most part of the address that indicates which network the IP address is a member. The subnet mask is used to identify the network portion of an address from the host portion. All devices on the same network will have the same network portion of the address. Providing a common language to describe networking functions and capabilities. Preventing technology or capability changes in one layer from affecting other layers above and below. Fostering competition because products from different vendors can work together. Assisting in protocol design because protocols that operate at a specific layer have defined information that they act upon and a defined interface to the layers above and below. Open standards encourage interoperability, competition, and innovation. They guarantee that no single company’s product can monopolize the market, or have an unfair advantage over its competition. Other standard organizations have responsibilities for promoting and creating the electronic and communication standards used to deliver the IP packets as electronic signals over a wired or wireless medium. International Telecommunications Union-Telecommunication Standardization Sector (ITU-T) - One of the largest and oldest communication standard organizations. The ITU-T defines standards for video compression, Internet Protocol Television (IPTV), and broadband communications, such as a digital subscriber line (DSL). Telecommunications Industry Association (TIA) - Responsible for developing communication standards in a variety of areas including radio equipment, cellular towers, Voice over IP (VoIP) devices, satellite communications, and more. Figure 2 shows an example of an Ethernet cable meeting TIA/EIA standards. Internet Assigned Numbers Authority (IANA) - Responsible for overseeing and managing IP address allocation, domain name management, and protocol identifiers for ICANN. Internet Corporation for Assigned Names and Numbers (ICANN) - Based in the United States, coordinates IP address allocation, the management of domain names, and assignment of other information used TCP/IP protocols. Internet Research Task Force (IRTF) - Focused on long-term research related to Internet and TCP/IP protocols such as Anti-Spam Research Group (ASRG), Crypto Forum Research Group (CFRG), and Peer-to-Peer Research Group (P2PRG). Internet Engineering Task Force (IETF) - Develops, updates, and maintains Internet and TCP/IP technologies. This includes the process and documents for developing new protocols and updating existing protocols know as Request for Comments (RFC) documents. Internet Architecture Board (IAB) - Responsible for the overall management and development of Internet standards. Internet Society (ISOC) – Responsible for promoting the open development and evolution of Internet use throughout the world. The primary purpose of a reference model is to aid in clearer understanding of the functions and process involved. The 7-layer Open Systems Interconnection (OSI) model is the most widely known internetwork reference model. It is used for data network design, operation specifications, and troubleshooting. A reference model is not intended to be an implementation specification or to provide a sufficient level of detail to define precisely the services of the network architecture. A protocol model closely matches the structure of a particular protocol suite. 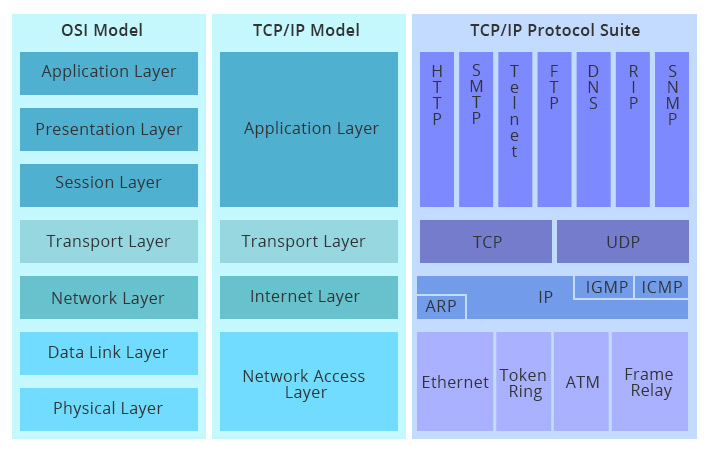 The 4-layer TCP/IP model is a protocol model because it describes the functions that occur at each layer of protocols within the TCP/IP suite. Communication between a web server and web client is an example of an interaction between several protocols. Ethernet - is a network access protocol: communication over a data link and the physical transmission of data on the network media. Network access protocols are responsible for taking the packets from IP and formatting them to be transmitted over the media. IP - is responsible for taking the formatted segments from TCP, encapsulating them into packets, assigning them the appropriate addresses, and delivering them to the destination host. A protocol suite is a set of protocols that work together to provide comprehensive network communication services. Rule Establishment: Before communicating with one another, individuals must use established rules or agreements to govern the conversation. Message Encoding: It is the process of converting information into another acceptable form, for transmission in the medium. After formatting (encoding) a message, the message must be placed inside another message (encapsulation). ✉ ✉ ✉Flow control: source and destination hosts negotiate how much information can be sent and the speed that it can be delivered. 🔊 Access Method: Determines when someone is able to send a message. Hosts on a network need an access method to know when to begin sending messages and how to respond when collisions occur. The frame has a source and destination in both the frame addressing portion and in the encapsulated message. Segmentation can increase the efficiency of network communications. If part of the message fails to make it to the destination, due to failure in the network or network congestion, only the missing parts need to be retransmitted. Communication begins with a message, that must be sent from a source to a destination. The sending of this message is governed by rules called Protocols. • If the communication is using voice, they must first agree on the language. •Next, when they have a message to share, they must be able to format that message in a way that is understandable. For example, if someone uses the English language, but poor sentence structure, the message can easily be misunderstood.